While there are already a number of ways to download webpages for offline use, the best way of archiving a web page (say, for work or a school project) is to save it as a PDF. You can find web-to-PDF conversion apps in iTunes, but they tend to be expensive–and wouldn’t you rather print to PDF from Safari? The Tweak: PDF Printer for Safari is the latest tweak from lordscotland, the developer behind Safari Download Enabler and Attachments+ for Mail. The PDF Printer tweak installs a button in the upper right-hand corner of Safari’s Printer Options dialog. Press the button and it will bring up a dialog with a preview of the PDF version of the web page, and from there you have an option of saving the draft. The default save directory seems to be ~/var/mobile/Downloads, and the save menu should be familiar if you’ve used Safari Download Enabler before. 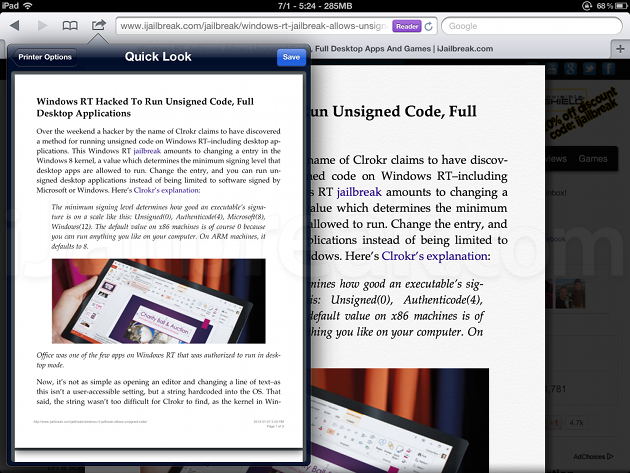 Safari, now with a plugin for printing directly to PDF. Caveats: There are a couple issues with the PDF Printer that might make you seek a different solution. The first issue is the tweak doesn’t save hyperlinks when you render a webpage–which isn’t a problem if you’re printing, but this takes some of the functionality out of the PDFs. According to the Cydia page, this is a limitation of the native rendering mechanism PDF Printer plugs into, which means we likely won’t see an update that restores links in the near future. The other issue is the lack of formatting options for the PDF document. This may tie in with the other limitation, but it would be nice to see support for grayscale or multiple pages per sheet. One possible workaround, if you want to simplify your pages, is to activate Safari’s Reader mode, which strips away distracts and provides basic size formatting options to play with–PDF Printer will print from the Reader pane. 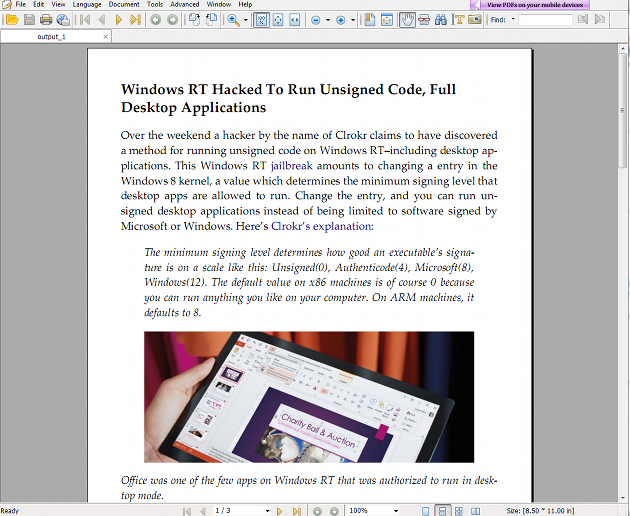 The PDFs are formatted perfectly, and appear with no issues on Windows. Where to find: PDF Printer for Safari is available for free in the BigBoss repository on Cydia. The tweak doesn’t show up on Settings or on the SpringBoard, just in Safari where it’s need. Would you use PDF Printer for Safari? Share your thoughts in the comments section below.